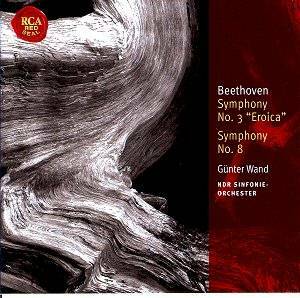 These recordings come from the complete cycle of Beethoven symphonies that Wand set down with the NDR orchestra in the 1980s (and originally issued on Deutsche Harmonia Mundi, I think.) Wand was chief conductor of this orchestra between 1982 and 1991. Collectors who have investigated Wand�s recordings of Schubert, Brahms and, of course, Bruckner will know that he was an extremely reliable guide to the central Austro-German symphonic literature, in which he was steeped. These performances demonstrate that this expertise most certainly extended to Beethoven. The Eroica is well suited to Wand�s style. He lays out the music faithfully and without fuss or show. His is a wholly musical approach, full of wisdom. You won�t get here the gaunt approach of Klemperer nor are there necessarily the imaginative vistas of Furtwängler but the results that Wand obtains are very satisfying and completely idiomatic. The first movement, complete with exposition repeat, is presented at a sane, forward-moving tempo that I like very much indeed. There�s just the right amount of weight but, even though this is �big band� Beethoven, there�s no sluggishness nor are the textures at all turgid. Wand balances the orchestra well; the horns, for example, are very well defined, though without excess prominence. The interpretation has the right amount of dramatic thrust, I think, with accents being used, as they should be, to propel the argument on. The funeral march is dignified. If I say it�s dry-eyed I don�t mean that the emotion in the music is underplayed. But the emotion is properly balanced and controlled. As was the case in the first movement (and, indeed, throughout the performance, tempi are judicious.) Wand gives an energetic reading of the finale. One slight reservation that I had while listening was that in this movement the woodwind could, perhaps, have been balanced just a shade more prominently when playing in the full ensemble. This left the music without quite the cutting edge that I like to hear. However, I think this is of a piece with Wand�s overall approach to the music and I must stress that this is a pretty minor reservation which may not bother other listeners at all. The Eighth Symphony may not be on quite the same scale as some of Beethoven�s other works in the genre. However, it�s a work of considerable stature and one that I like and admire greatly. Wand�s reading satisfied me very much. The first movement has a good amount of brio. In Wand�s hands the music is full of life and energy. The metronomic scherzando movement has a nice degree of lift and perkiness and the minuet is also well done. The finale has great purpose and zips along. If I seem not to have a great deal to say about this performance then that should be taken as a compliment. This is reading which is well played and well thought through. Overall, these are very good, reliable and well balanced readings. Wand has been well served by both his players and the Engineers and in turn Beethoven has been well served by everyone concerned. There are many fine versions of both symphonies in the catalogue already but these can more than hold their own. If the coupling suits then collectors can invest with confidence. Anyone buying this CD will find that it offers great musical rewards.